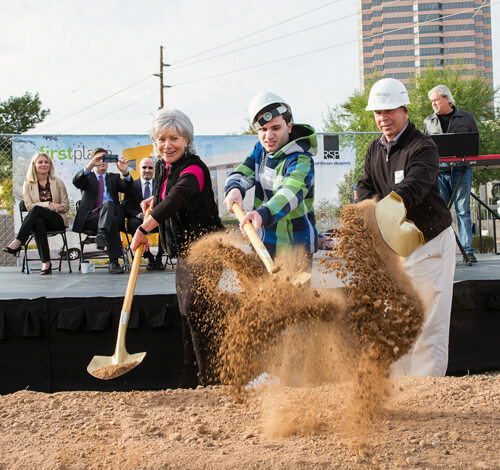 First Place®AZ broke ground today on First Place-Phoenix, a new $15 million residential property for adults with autism and different abilities with a one-of-a-kind approach to combining apartments, a residential training program and a national leadership institute to advance more independent and community integrated living options. Joining in the groundbreaking were Phoenix Mayor Greg Stanton; Arizona Department of Housing Director Michael Trailor; First Place Founder, CEO and SARRC Co-founder Denise D. Resnik; First Place Capital Campaign Cabinet Member and former ULI Arizona Board Chair John Graham; First Place Board Chair Sara Dial; and First Place participants and their families. First Place AZ is a 501(c)3 non-profit working hard to ensure that housing options for people with autism and other special abilities are as bountiful as they are for everyone else. First Place-Phoenix, an 81,000-square-foot property, is located in the heart of the urban area at 3001 N. Third Street in Phoenix. Denise D. Resnik, First Place AZ founder, has been contemplating new home options for years. Her 25-year-old son, Matt, has autism. “While First Place represents many things, the most important is that it will be home for the people who live there, including our son Matt, and provide more families with peace of mind,” added Resnik. 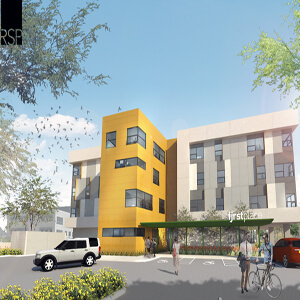 A $21.3 million comprehensive capital campaign continues; $15 million is dedicated to the development of First Place-Phoenix. The campaign represents charitable, private and public sources and also includes start-up operational funding, and fellowships for Teach For America alumni and Arizona State University doctoral and post-doc students. Early funding made the current First Place Transition Academy beta site possible, along with its collaboration with the Southwest Autism Research & Resource Center (SARRC), which serves as the Academy’s operating partner. Hardison/Downey construction of Phoenix is the general contractor and RSP Architects of Tempe is the architect. Residents are expected to move into First Place-Phoenix in 2018. Interested residents or participants in the First Place Transition Academy may apply online.